We received no compensation for this post! HUROM, a global market leader for premium slow juicers with patented slow squeeze technology, recently launched their best-selling HZ Slow Juicer in trendy Rose Gold – and they want to give YOU a chance to win one! 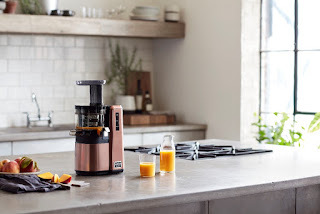 From September 25th to October 15th, simply register to win a HUROM HZ Rose Gold Slow Juicer ($599 value) by going to https://www.hurom.com/pages/hz-rose-gold-slow-juicer-giveaway.